What Are Possible Potential Leaks Around the Window? You are here: Home » » For the Homeowner » Home Maintenance-Consumer Info » What Are Possible Potential Leaks Around the Window? Windows pose a problem area for homeowners. Gaps, holes, or cracks can lead to leaks as well as being spots where your energy efficiency can be lost. You could say that as a home inspector that I am focusing on small items that do not seem too important. I know that there are people who read my reports, scratching their heads, saying why did he mention that fact. That is such a small issue that it cannot be a serious problem. Going through a few photographs from inspections last week, I came across one which may demonstrate the “why is that important” feeling, while allowing me to explain the reasoning behind my concern. 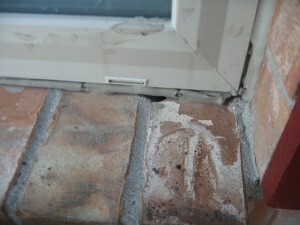 This is a photo of the joint between the window frame and the wall. What do you see? Are you focused on the hole? If you live in the house, you may say that you have not noticed any moisture stains on the wall there. Looking at the picture, you might notice that the brick trim for the window sill does look to be angled down, which allows water to shed. So is this a big deal? Some other facts are in order. This window is a hard to reach second story window that overlooks a two story entryway, so the homeowner cannot be hanging out by that window to see the first signs of moisture. Next, the damage may appear in a different spot, and not be associated with this window. This hole is also a gap in the building envelope, which is meant to be tight for energy efficiency. Starting to sound a little more important, is it not? I was in a house where there was a bad moisture damage problem on the first floor. No one could figure out why the area around this door and ceiling were always wet. The idea that there might be a plumbing pipe leaking was not correct, because all of the plumbing in the building was in the rear. Going in the attic, I could see a large hole in the roof. The hole was not so obvious from the ground, but just popping your head in the attic would have provided a clue. The water had run down the wall, where it hit the header of the door frame. That is the location where the water penetrated the interior wall covering. I know that rain does not come straight down every time. I know the damage a small hole can do. I spent a day walking the membrane of a commercial roof to find a pinprick sized hole. During heavy rains, the water collected in the ceiling until it poured down on the clientele. The hole may not seem like much, but I see it as a potential issue for larger damage. Take a look at the caulking around the window. The hole can be fixed with caulk, but mortar would fit the design. However, you can see that the window frame is sealed to the wall of the house with caulk. Not so bad in this picture, but you may see that the caulk is pulling away from the joint. This is a potential leak spot too. I usually tell my clients that caulking last for five years on average. The material lasts longer, but I decided upon the five year number from experience. You see, houses move. Slight changes have effects. Also, there may have been a problem during the application. The builder of this house was good and conscientious. Yet, on another home he constructed across the street, there were many problems with the caulking seals. On this home, there were signs of issues beginning. For your information, the home in the photo is a year old. I may not suggest caulking at potential spots, but I do write about the caulking seals in the report. In the case of this window, the caulk has puled away from the base, but the side still has some caulk well into the joint. The repairs cost only a few dollars. The potential damage could be several hundred. So let your home inspector pick out the small stuff; it could save you money in the long run. As long as you make the repairs. This entry was posted on Thursday, October 14th, 2010 at 12:30 pm	and is filed under Home Maintenance-Consumer Info. You can follow any responses to this entry through the RSS 2.0 feed.